The conclusion of a sports season can be a time of excitement, relief, and suffering for parents of athletes. The excitement comes when your young athletes have just concluded a season that exceeded their (and your) expectations. The conclusion of a sports season can be a time of excitement, relief, and suffering for parents of athletes. The excitement comes when your young athletes have just concluded a season that exceeded their (and your) expectations. 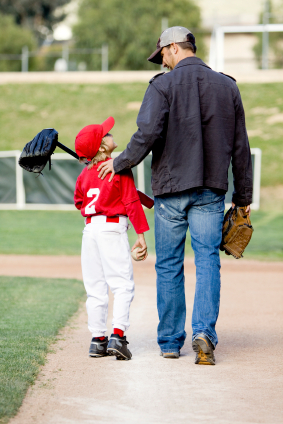 The sense of pride and satisfaction can be palatable and reinforces why you have your children involved in sports. The relief is in simply having the long season finally over with. For many parents, this means no more schlepping to practice and competitions, sitting in interminable traffic, staying in cheap hotels, or separating from your spouse (and maybe your other children) on Fridays. It now means having some time to just hang around the house after school and on weekends and pursue your other interests. The suffering comes if your children didn't have as successful a season as they (or you) had hoped. They may be frustrated, discouraged, and sad. As their parents, you, at best, feel their disappointment acutely and want to alleviate their pain (and your own). At worst, your disappointment and frustration is palatable and only adds to your children's misery (not a healthy thing, by the way). Here are seven things you can say and do that will help your children through this difficult period and actually enable them to emerge more inspired and motivated than ever to pursue their sport dreams. Perhaps the best thing you can do is actually something you don't do, namely, show your own disappointment. Your young competitor is feeling bad enough coming to grips with their own disheartening season. You add insult to injury when they feel your disappointment in their season. That burden will not only place an even heavier weight on their shoulders, but may also have a long-term and more damaging impact on their self-esteem, their motivation to continue sport, and their feelings toward you. As parents, you hate to see your children suffering, so it's natural for you to want to ease their ill feelings after a poor performance or a disappointing season by assuaging, placating, or distracting them from their decidedly unpleasant emotions. But, though offering short-term benefit, namely, your kids don't feel so bad for very long (which means you don't feel so bad), such efforts undermine their long-term emotional development and achievement efforts. My advice to you is: Let your children feel bad. Though far from a pleasant experience for either them or you, giving them the time and space for them to grapple with their own emotions can teach them many important lessons including how to understand and react to their unpleasant emotions, how to respond to and overcome failure, and how maintain a positive attitude and motivation in the face of setbacks. One of the challenges of being young is that children lack the wherewithal to see their lives beyond their immediate experiences. A difficult loss or a disappointing season can loom so large in their young psyches. This is where you can lighten their emotional load in a healthy way. Where they see only the bad of their just-concluded competition season, you can help them see their season in a more nuanced and, as a result, less awful way. In other words, you can provide your young competitors with perspective in which you offer a more balanced view of their season. Definitely acknowledge the bad parts of the season; the poor results, the lost chances, the frustrations and disappointments. At the same time, help them recognize the good that came from the season. If their season was really bad, you may need to stretch quite a bit to find the silver lining, but I'm sure it is there. Help them to see the improvements they made, the small though infrequent successes, the fun they had, the friends they made, the places they went, the crazy adventures you shared as a family. Finally, help them view the season from a long-term perspective. An analogy will help here. If you look at a bad year in the stock market, such as during the Great Recession, you would see a steady and steep downward trend line in stock valuations. It would be pretty darned discouraging if you invested in the stock market and you'd probably never want to invest in stocks again. That is what your young athlete may be seeing and feeling about their own disappointing season. But, if you look at the stock market over the last 60 years, you will see a jagged line that climbs steadily higher. This is the perspective you want your children to have about their sport: if they continue to invest in themselves and are patient, they can expect a very good return on investment in the future. After a few weeks with their sports gear stored away, as the disappointing season fades into memory and your children focus their attention on other pursuits (e.g., school), you can expect that their anguish will slowly recede as well. With the benefit of some emotional distance from the unsatisfying season, they may now be receptive to a gradual shift from the past to the future. What areas held me back? What do I need to work on to achieve my goals next season? These lessons are important because they ensure that your children understand what caused their season to go as it did, whether good, bad, or really ugly, and give them guidance on how to learn from them and do better next season. With a clear understanding of what prevented your young athletes from having a successful season or knowing what worked really well this past season, you can now help them redirect their focus from the past to the future. They can use the information gained from their examination of the lessons learned to set new goals for next season. These goals can begin with realistic outcome goals to strive for, in terms of results, rankings, or new levels of competition. They should then make an immediate shift to process goals that will alleviate the obstacles that resulted in their disappointing season or build on the benefits they gained from their outstanding season. These process goals should include any areas of their sport that they need to improve on to ensure that next season is better than their last, for example, physical conditioning, technique and tactics, and, of course, mental preparation. This goal setting will, hopefully, close the door completely on the last season and provide them with the inspiration and incentive to begin working hard toward next season. The final step in supporting your young athletes after the competition season is to help them develop a plan that will put their goals into action. This detailed plan, in collaboration with their coaches, should include a comprehensive physical conditioning program, ongoing practice opportunities to continue their technical and tactical development in their sport, and a comprehensive mental training program. With clear goals to work toward and a plan for achieving them, your young athletes are now in a position to put last season in its entirely behind them and to direct their gaze toward a successful next season. Perhaps the most important thing you can do at the end of the season is to not make too big a deal about it, regardless of whether it was a breakthrough season, a stuck-in-neutral season, or a full-reverse season. If you keep your kids' sport in perspective and focus on all of the wonderful things they get out of our crazy sport, they are more likely to as well. Then, tell them you will continue to support them as long as they have dreams in their sport they want to pursue. Next, send them the most powerful message of all, that will make them feel good whether their season was worthy of celebration or mourning. Give them a big hug and say "I love you." When you've done that you know you've done your job as sport parents. Finally, ask your children where they want to eat! Note: To learn more about how you can be the best sport parent you can be, get my FREE Prime Sport Parenting: Raising Successful and Happy Athletes e-book.